Since 2007 the number of people getting affected by all types of flu has remained the same. Sample tests by AIIMS in Delhi and Ballabhgarh show that the influenza virus affects six to 10 per cent of the population every year. 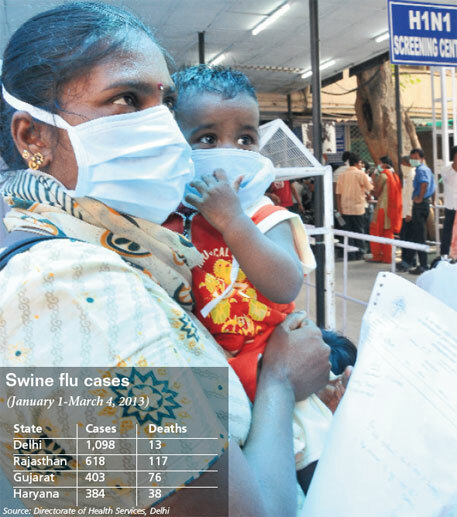 Before 2009, the year swine flu hit India, three strains of influenza virus were affecting the country’s population. These were influenza A H1N1, A H3N2 and influenza B. In 2009, another strain was discovered—A H1N1 (pdm) (pdm stands for pandemic). This strain had affected half of the population taken ill with the flu in 2009 (30 per cent) and 2010 (17 per cent). By 2011, however, the pdm strain disappeared, while strains A H3N2 and B made a comeback. This was due to vaccination and immunity the Indian population developed after the pandemic outbreak. In 2012, from March till October, very few test samples showed H1N1 (pdm), while strain B dominated influenza. But after that pdm took over again. Till February this year it was found in nearly 80 per cent of those infected. “The rate of infected population was a more than four per cent last year. It is 5.3 per cent from October 2012 to February 2013,” says Lalit Dar, head of the microbiology department of AIIMS. Data shows the peak months for flu are February and March in winters and July and August in monsoons.